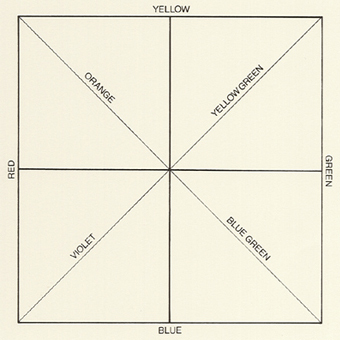 On the disappearance of the old order of colours from bright to dark — or from black to white — at the end of the 17th century, and at the time when Isaac Newton had introduced a new system of colours, the Englishman Richard Waller was attempting to discover if the colours could be arranged within a square. He published his attempts in order to provide a «Standard of Colours», since he complained that until that time, standard terms of reference had not become established amongst the philosophers. This was regrettable, he said, because the science of colours exceeded the demands of medical diagnosis, and now had to serve the added purpose of cataloguing the Creation. 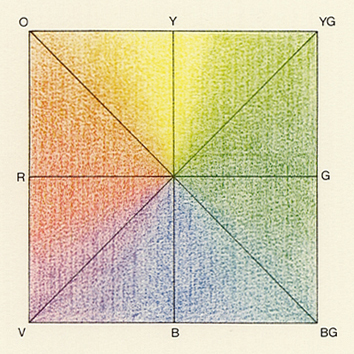 We reproduce Waller’s system with its four basic colours — yellow (Y), red (R), blue (B) and green (G) — which are not placed at the corners of the square, but in the middle of each respective side. The resultant mixtures can then be entered in the fields of the grid thus formed. Waller did not determine these middle hues intuitively, but according to their weight. In other words, he mixed each basic pigment at equal proportions of weight. If we separate Waller’s square into primary and secondary lines (below left, or right), the diagonals will reveal themselves as the loci of synthesis. The mixed colours — orange (O), yellow-green (YG), blue-green (BG) and violet (V) — will then result, in the physical sense, from the forces which embrace the pure colours. 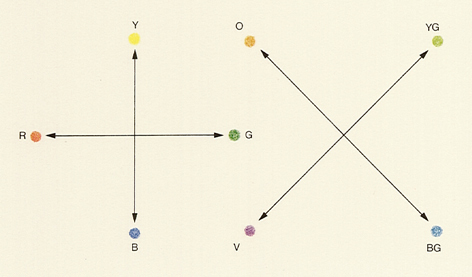 Waller published his system in about 1686 under the title Catalogue of Simple and Mixt Colours. His square represents the final obstacle on the way to Newton, who had been occupied with his optical experiments since 1670, and had imposed a fundamental physical way of thinking upon the future order of colours. At this point, there was above all a change in the old viewpoint — which was to view the formation of colours as a modification of white light by mixing it with darkness. (Johann Wolfgang von Goethe will, however, revitalise these ideas about the turbid medium with great vigour.) The idea that colours are not actually changes imposed on white light, but are in fact its original components, was gained through experiments with a prism. In 1648, the Bohemian physicist Marcus Marci had used a prismatic glass for the first time, allowing sunlight to enter a darkened room through a small opening, and then directing the resultant ray through a prism. He saw a series of colours which we now call the spectrum: red, white and violet. Marci noted that the modification seemed dependent on the angle through which the light was deflected, and also remarked that coloured light cannot be subjected to further separation. In Bologna of the same period (1650), F. M. Grimaldi discovered that small openings will leave a trail of coloured light traces. This is nowadays explained by so — called diffraction. The physics of colour — prior to Newton — then gained real momentum with Robert Hooke, who began to investigate the colours which occur if light is refracted on thin fragments of mica, or between glass plates. In his Micrographia, Hooke also made bold assumptions about the nature of light For him, a wave motion was involved, and he believed that a wave — surface perpendicular to the ray produced white light, and that the inclination of this surface gave rise to colour, which took effect on the edge of a light ray. Colours as the inclination of a wave surface — only a physicist could think of that! But the champions of science had yet more vivid ideas, and these will occupy us in some of the following plates. Date: The system was introduced in 1686 in a Catalogue of Simple and Mixt Colours. Bibliography: R. Waller, «A catalogue of simple and mixt colours», Philosophical Transactions of the Royal Society, XVI, 1686; F. Gerritsen, «Entwicklung der Farbenlehre», Göttingen 1984; John Gage, «Colour and Culture, Practice and Meaning from Antiquity to Abstraction», Thames and Hudson, 1993, p.169 (mention and comment).